It is happened that i was listening the latest BOT episode, where Jack and Steven were discussing refrigeration. Also A few days ago i guy i know bought a mini fridge. I had a look at the manual and I soon understood that the fridge worked with Peltier plates. - I find their ability to WARM the inside space questionable. - I notice that the hotel room sized fridge consumed 70watts, and that i think is quite a lot for the fridge's size, compared to the modern day A++ class fridges. - These fridges cannot make ice. on the other hand price is low, and there is an inbuilt ability to work both with mains and 12V electricity. BTW, how do i post such a question for the next BOT episode? I cannot find the way to in the episode notes. Re: Peltier (Thermoelectric cooling) Refrigorators? 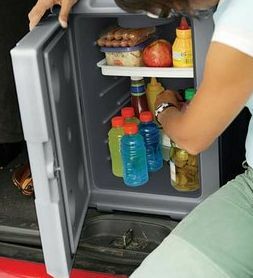 None of the inexpensive ones I've seen could get the internal temperature down low enough (~37 deg F) to really function as a true food-safe refrigerator. The one I tried (amazon link) claims to get down to 36F below ambient temperature. Here in summer that's like 60F. Are there better ones out there? I wonder how do the prices compare to similarly sized conventional compressor refrigerators? While they do 'work',they are not efficient or effective when compared to other MECHANICAL methods of thermal transfer. As a gadget to cool my insulin or for direct thermal transfer they are great...but for large scale heating/cooling.....just not so good. I have a Coleman Powerchill that I got cheap a couple of years ago. It works to being the temperature down to around 40F below ambient, like you said. We rarely use it, it's just not very useful for us. - since it pulls so much power, we need to have hookups to keep it running all the time, might as well get a small fridge to carry to these situations. This did come with a very nice wall wart transformer to plug the 12v plug into. I use that a lot more than the cooler. I see. but what about larger units like this regarding temperature performance? Though my few experiences with regular minibar fridges are not that impressing too. That looks about the same size as my Powerchill. It is a portable camping style device. But it runs either horizontal or vertical. It's a 40 quart, I think. My mini frig in the basement to keep my sheet film cold will some times freeze it as long as I keep it defrosted. Above 65F ambient or so I'd relegate them to chilling drinks and stuff rather than holding food at safe temps. I ran one in my BOV for about a year. I had generous amounts of power from solar so the constant drain was not a big deal for me. Power draw can be greatly reduced by adding in a $10 temperature control set to hold 35F or whatever. Otherwise it will stay on all the time and pull 60-70w or whatever.